When the getContext() method of a canvas element is invoked with 2d as the argument, a CanvasRenderingContext2D object must be returned. There is only one CanvasRenderingContext2D object per canvas, so calling the getContext() method with the 2d argument a second time must return the same object. The setTransform(m11, m12, m21, m22, dx, dy) method must reset the current transform to the identity matrix, and then invoke the transform(m11, m12, m21, m22, dx, dy) method with the same arguments. Both attributes can be either strings, CanvasGradients, or CanvasPatterns. On setting, strings must be parsed as CSS <color> values and the color assigned, and CanvasGradient and CanvasPattern objects must be assigned themselves. [CSSCOLOR] If the value is a string but is not a valid color, or is neither a string, a CanvasGradient, nor a CanvasPattern, then it must be ignored, and the attribute must retain its previous value. The serialization of a color for a color value is a string, computed as follows: if it has alpha equal to 1.0, then the string is a lowercase six-digit hex value, prefixed with a "#" character (U+0023 NUMBER SIGN), with the first two digits representing the red component, the next two digits representing the green component, and the last two digits representing the blue component, the digits being in the range 0-9 a-f (U+0030 to U+0039 and U+0061 to U+0066). Otherwise, the color value has alpha less than 1.0, and the string is the color value in the CSS rgba() functional-notation format: the literal string rgba (U+0072 U+0067 U+0062 U+0061) followed by a U+0028 LEFT PARENTHESIS, a base-ten integer in the range 0-255 representing the red component (using digits 0-9, U+0030 to U+0039, in the shortest form possible), a literal U+002C COMMA and U+0020 SPACE, an integer for the green component, a comma and a space, an integer for the blue component, another comma and space, a U+0030 DIGIT ZERO, a U+002E FULL STOP (representing the decimal point), one or more digits in the range 0-9 (U+0030 to U+0039) representing the fractional part of the alpha value, and finally a U+0029 RIGHT PARENTHESIS. Throws an INDEX_SIZE_ERR exception if the offset it out of range. Throws a SYNTAX_ERR exception if the color cannot be parsed. If any of the arguments are not finite numbers, throws a NOT_SUPPORTED_ERR exception. If either of the radii are negative throws an INDEX_SIZE_ERR exception. The addColorStop(offset, color) method on the CanvasGradient interface adds a new stop to a gradient. If the offset is less than 0, greater than 1, infinite, or NaN, then an INDEX_SIZE_ERR exception must be raised. If the color cannot be parsed as a CSS color, then a SYNTAX_ERR exception must be raised. Otherwise, the gradient must have a new stop placed, at offset offset relative to the whole gradient, and with the color obtained by parsing color as a CSS <color> value. If multiple stops are added at the same offset on a gradient, they must be placed in the order added, with the first one closest to the start of the gradient, and each subsequent one infinitesimally further along towards the end point (in effect causing all but the first and last stop added at each point to be ignored). The allowed values for repeat are repeat (both directions), repeat-x (horizontal only), repeat-y (vertical only), and no-repeat (neither). If the repetition argument is empty or null, the value repeat is used. To create objects of this type, the createPattern(image, repetition) method is used. The first argument gives the image to use as the pattern (either an HTMLImageElement, HTMLCanvasElement, or HTMLVideoElement object). Modifying this image after calling the createPattern() method must not affect the pattern. The second argument must be a string with one of the following values: repeat, repeat-x, repeat-y, no-repeat. If the empty string or null is specified, repeat must be assumed. If an unrecognized value is given, then the user agent must raise a SYNTAX_ERR exception. User agents must recognize the four values described above exactly (e.g. they must not do case folding). The method must return a CanvasPattern object suitably initialized. The image argument is an instance of either HTMLImageElement, HTMLCanvasElement, or HTMLVideoElement. If the image is of the wrong type or null, the implementation must raise a TYPE_MISMATCH_ERR exception. If the image argument is an HTMLImageElement object whose complete attribute is false, or if the image argument is an HTMLVideoElement object whose readyState attribute is either HAVE_NOTHING or HAVE_METADATA, then the implementation must return null. If shadowBlur is less than 8, let σ be half the value of shadowBlur; otherwise, let σ be the square root of multiplying the value of shadowBlur by 2. If the anticlockwise argument is false and endAngle-startAngle is equal to or greater than 2π, or, if the anticlockwise argument is true and startAngle-endAngle is equal to or greater than 2π, then the arc is the whole circumference of this circle. To indicate which focusable part of the canvas is currently focused, authors should use the drawFocusRing() method, passing it the element for which a ring is being drawn. This method only draws the focus ring if the element is focused, so that it can simply be called whenever drawing the element, without checking whether the element is focused or not first. The position of the center of the control, or of the editing caret if the control has one, should be given in the x and y arguments. If the given element is focused, draws a focus ring around the current path, following the platform conventions for focus rings. The given coordinate is used if the user's attention needs to be brought to a particular position (e.g. if a magnifier is following the editing caret in a text field). Transform the given point (x, y) according to the current transformation matrix. If the first argument isn't an img, canvas, or video element, throws a TYPE_MISMATCH_ERR exception. If the image has no image data, throws an INVALID_STATE_ERR exception. If the second argument isn't one of the allowed values, throws a SYNTAX_ERR exception. If the image isn't yet fully decoded, then nothing is drawn. If the image argument is an HTMLImageElement object whose complete attribute is false, or if the image argument is an HTMLVideoElement object whose readyState attribute is either HAVE_NOTHING or HAVE_METADATA, then the implementation must return without drawing anything. If the source rectangle is not entirely within the source image, or if one of the sw or sh arguments is zero, the implementation must raise an INDEX_SIZE_ERR exception. Returns the one-dimensional array containing the data. If the first argument isn't an ImageData object, throws a TYPE_MISMATCH_ERR exception. Throws a NOT_SUPPORTED_ERR exception if any of the other arguments are not finite. The createImageData() method is used to instantiate new blank ImageData objects. When the method is invoked with two arguments sw and sh, it must return an ImageData object representing a rectangle with a width in CSS pixels equal to the absolute magnitude of sw and a height in CSS pixels equal to the absolute magnitude of sh. 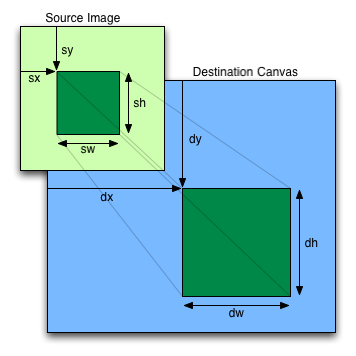 When invoked with a single imagedata argument, it must return an ImageData object representing a rectangle with the same dimensions as the ImageData object passed as the argument. The ImageData object return must be filled with transparent black. The object's indices of the supported indexed properties are the numbers in the range 0 .. h×w×4-1. When a CanvasPixelArray object is indexed to retrieve an indexed property index, the value returned must be the value of the indexth component in the array. When a CanvasPixelArray object is indexed to modify an indexed property index with value value, the value of the indexth component in the array must be set to value. If the first argument to the method is null or not an ImageData object then the putImageData() method must raise a TYPE_MISMATCH_ERR exception.